There are two different ways how the filter performs data download. When Downloading the clip option is checked, filter performs media file download independently of playback. So it will continue to download even if playback is paused. And will never re-download the same data again. This way is useful when you have slow or unstable Internet connection, or when you need to seek a lot within a file, or when there are long pauses at playback. However if all these cases are not about you, and usually you do not watch whole video, it may end up with bandwidth overuse since a lot of downloaded data eventually will be not watched. In this case you may try to uncheck this option. It will download then only data that is need for playback right now, without any caching. Filter will reserve disk space for the files at the start of download. So you will not run out of free disk space when download is in progress. 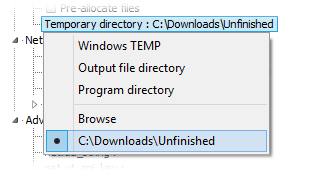 Filter downloads the file from initial seek position to the end. For example, if you will seek to middle of the file right after playback start, it will download only second half of the file. Progress is notified only about file part that is downloaded. I.e. in previous example, progress 100% means that second half of the file was downloaded. If you seek then to the file begin, filter will start download first half of the file because it was skipped previously. Since second half was already downloaded (it does not re-download any data which it already has), it will start progress from 50%.